Sunday, March 29 1908 -- The independently owned trolley systems of Los Angeles were under seige by the Southern Pacific railway at this time. The trolley system was so widespread in the area that the railroad worried that they would eventually be able to consolidate, add freight service, and thus make competition for SP. SP's answer to the problem was to try to buy up the trolley companies, a plan that worked rather well. By 1911, they had purchased the biggest fish in the pond, and that was the beginning of the very slow breakdown of the trolleys. SP kept them running, but they rarely invested any money except in lines that would have potential for freight carriage. 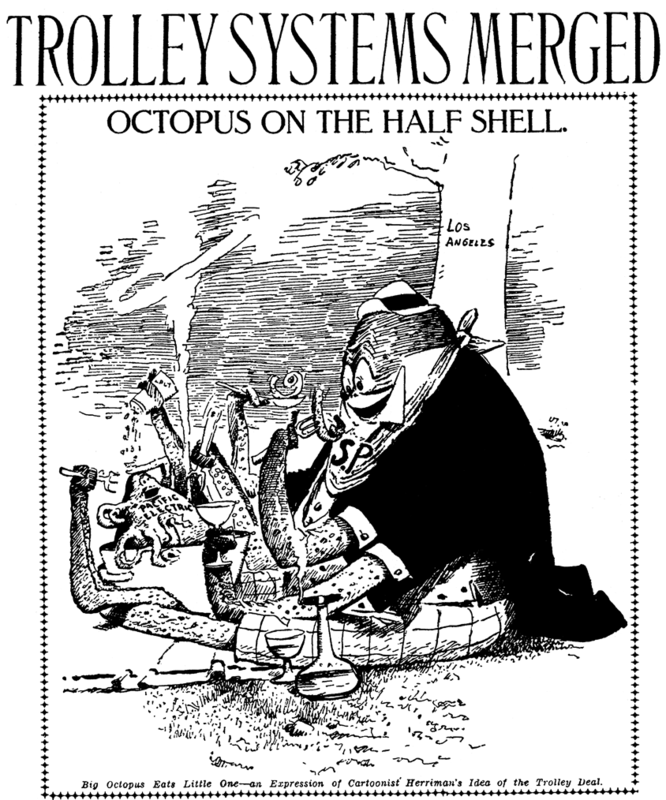 There's a lot to the story of the LA trolleys, way more than I can even hint at here. 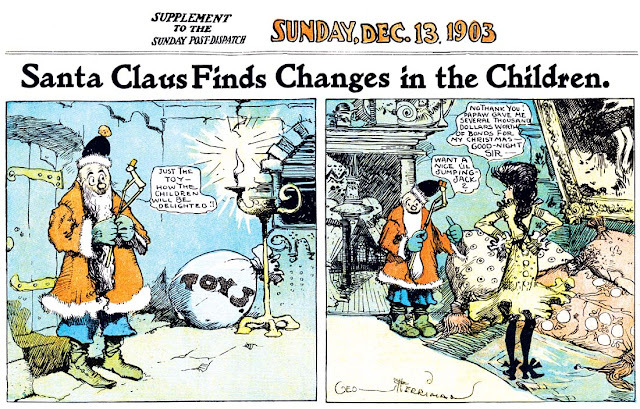 Try this short but informative history on for size, dust off your videotape of Who Framed Roger Rabbit, and read about an attempt to bring the streetcars back to L.A.
Way back in 2008, I wrote an Obscurity of the Day post about a very unusual strip. It was called Adam Chase, and it was a weekly color science fiction strip that appeared in the Eugene (OR) Register-Guard. The combination of local, color and science fiction is pretty much a trifecta of 100-1 shots in the world of newspaper strips, so I was very interested in contacting the creator, Russ Morgan, to find out more about his unique creation. Occasionally when I publish a post asking a creator to come forward I get lucky. But that wasn't the case with Russ Morgan. Although I had what I believed to be a correct email address, the creator of Adam Chase remained stubbornly private. That is, he did until just a month or so ago. Much to my delight, Russ Morgan finally stumbled across that old blog post (he'd never gotten my email) and sent me a gracious and friendly message offering any information I might want about the strip. Never one not to take a mile when an inch is offered, I found out that Russ had archived a set of his strips (which actually ran two years, not the one year I thought), and with very little arm-twisting I convinced him to loan them to me for scanning. It turned out that the strip I had termed 'a wacky sci-fi romp' based on a few isolated sample strips was actually not a campy fantasy at all, but relatively serious science fiction. In other words, think Star Trek, not Lost in Space. But you don't have to take my word for it. Because starting today, every Friday on the Stripper's Guide blog are now Sci-Fridays, in which we can all enjoy an episode of Russ Morgan's Adam Chase! I started teaching myself to draw in high school and developed an interest in comic strips and science fiction. In 1966, as a staff artist at his local newspaper, I offered the idea of Adam Chase to the editors and they bought it. It ran for two years in color as a feature page in the Sunday newspaper's magazine, Emerald Empire. After completing the strip, I opened my own graphics and advertising company, which I operated for 25 years. Most recently, I returned to being a staff artist at a daily newspaper, the Bend Bulletin in Oregon and retired in 2010. I play lots of golf, travel and restore classic Ford cars. Adam Chase ran for two years in a medium-sized Oregon daily newspaper with a circulation of about 35,000 at the time. I was a staff artist at the R-G doing ad art, maps, story illustrations, cartoons etc., but I also had an interest in sci-fi, rockets, space, etc. 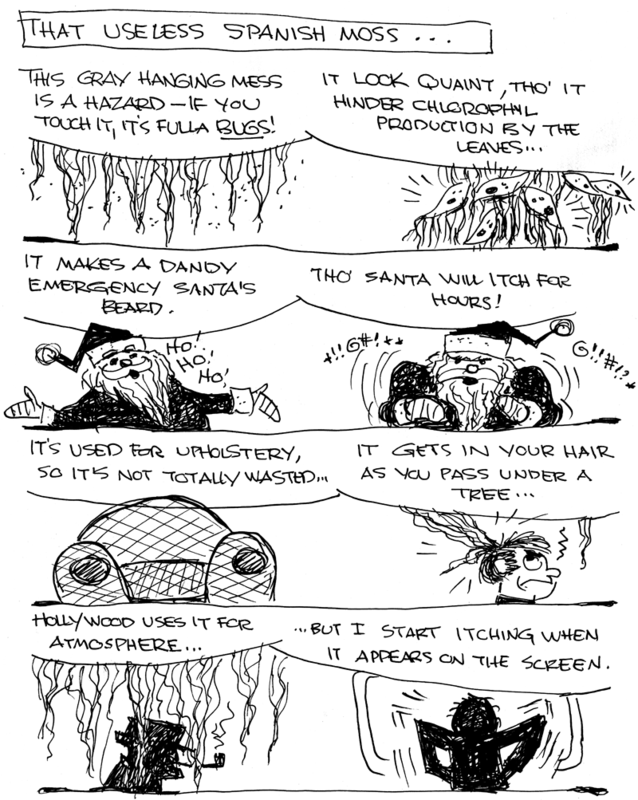 I came up with the idea of the strip and pitched it to the editor. He wanted to see an outline and some examples of my "comic strip" work. I told him I'd do four or five panels and give him a two year story line. When I presented it to all the editors, they bought it immediately and I was off to the races. They commented at the time that the R-G would probably be the only newspaper in the US with a strip of this kind all their own. I did the comic strip on my own time and was paid separately from my regular job. It was part of the Sunday magazine and ran in color. It was printed thru the old technology of zinc engravings, mats and lead plates, which explains some of the poor quality and registration. Some weeks, the printing plant might omit the red or blue plate. I illustrated mainly with brush but used pen and ink for some detail. Color overlays were produced on acetate, using zip-a-tone and black ink for color tints in C-M-Y. 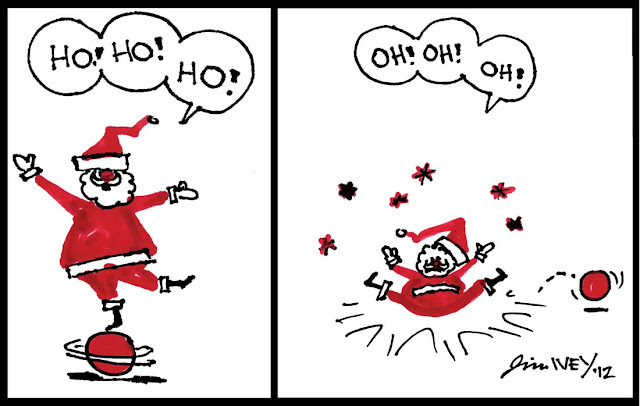 I both wrote and illustrated the strip. I quit the strip because I left the Register Guard to go into business for myself, besides, it paid virtually nothing. It was a labor of love. I guess you could say that I was influenced by my imagination and passion to create something that would capture peoples' interest. Hopefully, as Sci-Fridays unfold Russ will find time to comment further upon his experiences doing a local science fiction strip in Oregon. 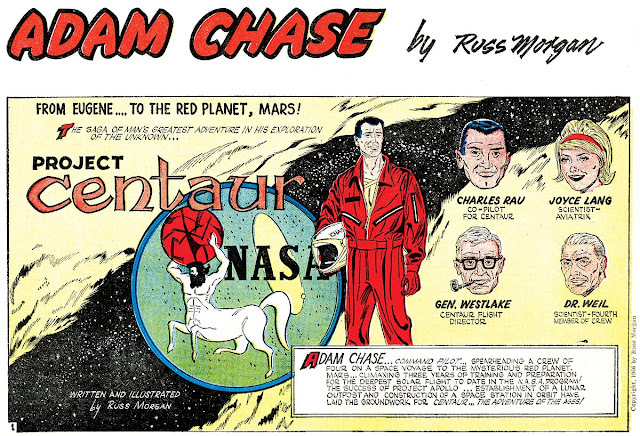 But for now, let's get Sci-Fridays started with Adam Chase strip #1, originally published June 5 1966! Copyright renewed (c) 2012 Russ Morgan. All rights reserved. This promises to be great fun. Hi Alan! I just came across your Adam Chase strips and was very happy to do so. I live in Eugene Or, and actually met Russ about 20 years or so ago. Wonderful to finally see more than a small sampling of these strips. I do think you should attempt to print as many of year 2 of the strip as you can, or they'll likely be lost to posterity. Albert Jacob Fagaly was born in Kentucky on January 5, 1909, according to the California Death Index at Ancestry.com. There are three family trees at Ancestry.com; one of them has his middle name, while the other two say he was born in 1908. His son, Robert, wrote about his father and it was posted at a family tree. In the 1910 U.S. Federal Census, Falgaly was the youngest of three sons born to Robert and Laura [sic: Lura, according to Robert]. They lived in Waynesburg, Kentucky. His father was a farmer. …From his telling, his schooling was average except in geometry, in this he was extremely good…in fact one of his teachers suggested that he go on to college...But, I think that geometry was the only technical subject that he excelled in. He was editor of his high school yearbook and graduated from Fort Vancouver High School. And while in high school, was a member of an amateur boxing team and played baseball….He also had a good art teacher. After high school, the depression hit and he opened up a second hand store….People at that time were in need of money, so my Dad’s second hand shop was quite good. But he also wanted to get his cartoons in the papers. The local newspaper “The Vancouver Columbian,” could not afford to have photo-engraving plates made, so my father opened up a photo-engraving shop which eventually became “The Columbia Photo-Engraving” and he would supply them for free (in the late 1920's), if they would buy his cartoons, which they did. That is how he got started in newspapers as a cartoonist. He also did sign painting, as one of those things for extra money. He did swap outs, where he painted signs, for someone for free and in return would take clothes and other services. He did not want to be a painter, but he did want to be a cartoonist. That was his goal…. Although he never attended art school he took a correspondence course from the Landon School of Art. This, he said, helped him more than anything else in his art work. Robert wrote, “In the 1930's he moved to New York and began one of the many attempts to become a successful cartoonist. He did comics—seven or eight comic books, on his own and with others. He did many strips in the 30’s and 40’s….And one of his roommates in New York was Mickey Spillane, who was also trying to write a novel. He was either the best man at my father's second marriage, or was my Godfather….” Fagaly may have ghosted Calvin Fader’s Doggy Dramas Present in the late 1930s. His comic book credits are here. In the 1940 census, Fagaly was a member of his brother’s household in Vancouver, Washington at 508 West 9th Street. He was a commercial artist in a photography shop, and had four years of high school education. Robert said his father met Justine Lewis around 1941, and in 1942 they went to Washington and married. They returned to the east coast, where Robert was born in Massachusetts. He said the idea for There Oughta Be a Law (originally called The Bitter Laff) came in November 1944. It was sent to Harry Shorten, and, quickly picked up for syndication. Robert said they moved for his health, in 1950, to North Miami, where his younger sister was born. They lived there until 1958, then moved to Pasadena, California before settling in Newport Beach, where Fagaly had a close friend. In 1962, they moved to the Irvine area. Fagaly passed away April 25, 1963, in Orange, California, according to the California Death Index; Robert said the date was April 23. The Press-Courier, (Oxnard, California), published news of his death April 30. Newport Beach (UPI) - Funeral services were to be held to day for Albert Fagaly, 54, creator of the syndicate cartoon “There Oughta Be a Law” that appeared in 300 daily newspapers. Mr. Fagaly died Thursday [April 25] at Hogal [sic: Hoag] Presbyterian Hospital. Survivors include his widow, Mrs. Margaret Fagaly, a son, Robert, and two daughters, Russelle and Maralyn. Interesting! It was always obvious that Fagaly was heavily indebted to Jimmy Hatlo. Do you know if he worked directly for Hatlo as an assistant, or if he worked on "It Happens Every Time" as a syndicate employee? The 1925 Iowa State Census recorded the Zurawski family of four (Mary, the new addition) in Davenport, Iowa, at 315 East 15 Street. In the 1930 U.S. Federal Census, the Kent family lived in Houston, Texas at 2011 Bartlett. His father was floor covering salesman. 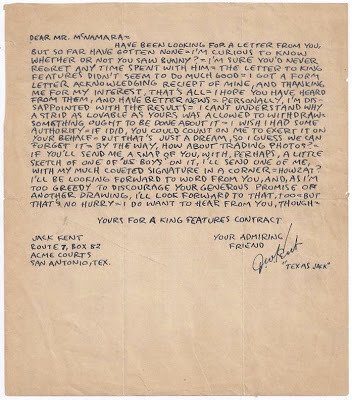 The Mobile Press and Register (Alabama), December 3, 1978, said he “spent his early years in Chicago, and ‘was raised and educated from here to there all over the United States.’ ” A fan of Tom McNamara, Kent sent numerous letters and cards to him: undated letter; 1934 letter; Christmas card. The 1940 census recorded him in San Antonio, Texas, at 323 Adams Street. He had three years of high school and was a staff cartoonist at an insurance company. The San Antonio Light (Texas), May 29, 1951, said: “…Jack received much of his schooling in San Antonio. He attended the Highland Park Elementary school and Thomas Nelson Page Junior High. Then he went to Tech High in Dallas.” According to Comic Strip Artists in American Newspapers, 1945-1980 (2003), he “…was without formal training in art, but at 15 he began to sell cartoons to magazines, including Collier’s. 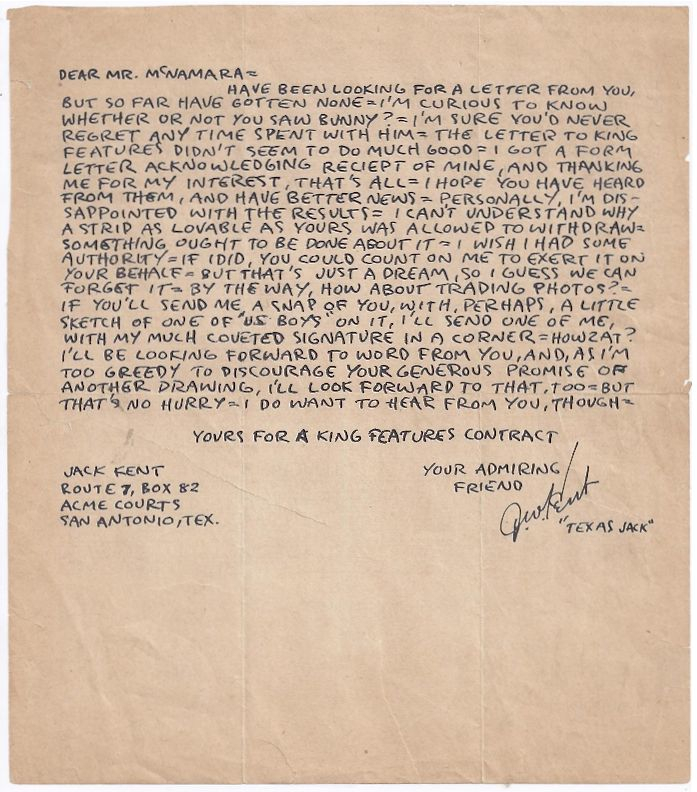 He wanted to emulate George Herriman…” During World War II, Kent served in the army field artillery from 1941 to 1945; at his discharge he was a first lieutenant. Who’s Who said he produced free-lance cartoons for various magazines from 1945 to 1950. 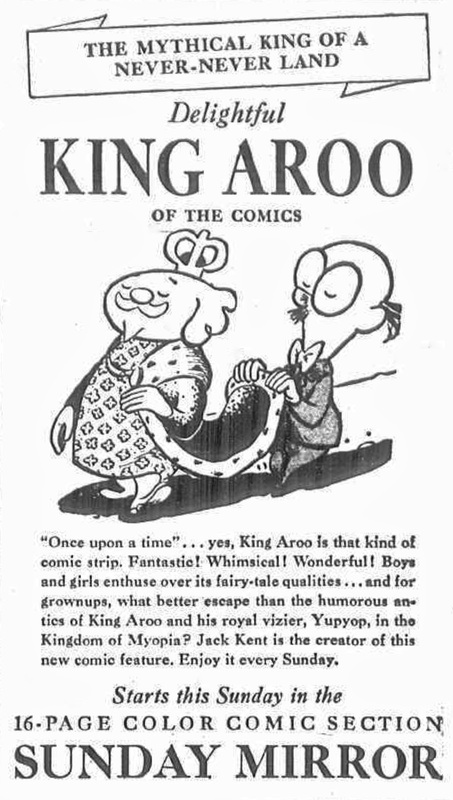 His comic strip, King Aroo, debuted November 1950; it was distributed by the McClure Syndicate. 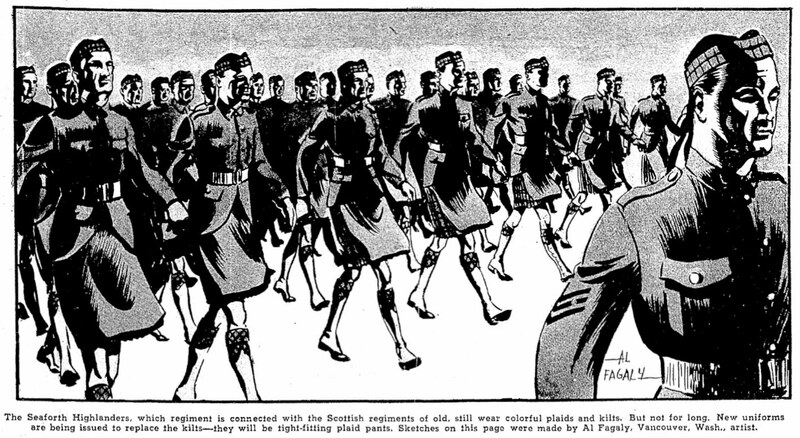 Newsweek, July 14, 1952, explained how Kent’s war-time service figured in King Aroo. Comic-strip addicts, probably as a survival technique, quickly get used to the strange words of their favorite characters. So, when Wanda Witch, one of the weird figures who inhabit a batty land called Myopia in the McClure Syndicate’s strip King Aroo, began mouthing strange incantations, most readers just went on to the next balloon. To the editors of The Philippine-American Advocate, a new monthly tabloid in San Francisco, however. Wanda’s incantation conjured up something quite meaningful. Last week, in its first issue, The Advocate explained that the chant, “halika, multo, madali, madly,” is purest Tagalog for “come here, ghost, quickly, quickly.” It was not the first time nor the last time that King Aroo characters would chatter in the native language. 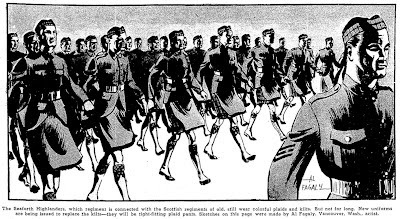 Jack Kent, the Texan who draws the strip, had studied the language while overseas in the Philippines with the Army. Moreover, for the witch talk, he had even checked the Tagalog with authorities at the National Language Institute of the Philippines. In the Springfield Union (Massachusetts), June 25, 1951, columnist Walter Winchell noted Kent’s pursuit of Leigh Allen, who was in the Broadway production South Pacific: “…Sends her a red rose daily, neatly boxed, which arrives just before curtaintime backstage…” His marriage to Juliet Bridgman, on September 27, was reported in the Chicago Tribune, October 2, 1952. Who’s Who said he remarried to June Kilstrofte, June 9, 1954. In the Mobile Press and Register, Kent said, “…In 1954 a gal reporter from the San Antonio Express came to interview me and we got married and lived happily ever after….” Their son, John Jr., was born in July 1955. Kent’s father passed away February 4, 1959, according to the Texas Death Index at Ancestry.com. His second published comics work was the one-time seasonal strip, Why Christmas Almost Wasn’t, in December 1968. That same year saw the publication of his first book, Just Only Jack, the first of over 60 books. Kent passed away October 10, 1985, in San Antonio. A profile by his son is here. Another profile is here. In 2010, the Library of American Comics published King Aroo Volume 1: 1950–1952, and it has Bruce Canwell’s biography of Kent, from his birth to 1952; volume two is forthcoming. King Aroo original art can be viewed here. If you dig parodies, Allan, here's one of me wee ones. Thank you. My son and I enjoyed reading these. Thanks! Great stuff. Is that it for King Ling strips?